Education Perfect has developed original NAPLAN Numeracy practice material to help in both identifying and remedying each student's individual strengths and weaknesses. For information on Education Perfect's Literacy preparation material, see Using Education Perfect to prepare for the NAPLAN Literacy tests. NAPLAN Pre and Post Tests: Assessments created by the Education Perfect team in the style of NAPLAN tests. 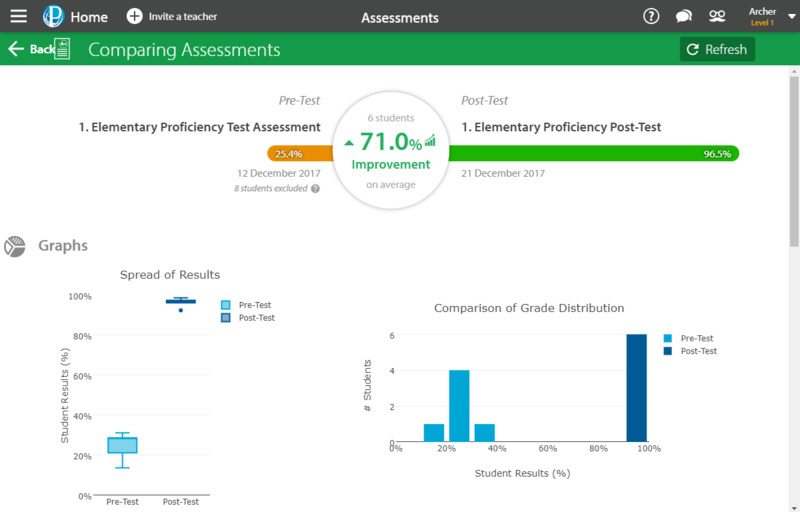 When completed, pre-tests will give you a breakdown of each student's abilities and recommend remedial tasks from the NAPLAN Resources folder. Once the students have learnt the topic, they can sit post-tests; the results of which are intended to be compared with those of the initial pre-tests, so that you're able to grasp how much your students have improved across different topics. NAPLAN Resources: Smart Lessons which teach the skills tested by NAPLAN, such as Linear Patterns and Rules. These activities contain a combination of information slides to teach the skills and questions to test students' understanding. NAPLAN Practice: Smart Lessons containing a bank of sample questions which students can use to practice their skills. Once the test is complete, it will be automatically marked for you. Use the analysis provided to get an indication of your class' skill level, then assign our automatically generated recommendations to give each student a differentiated course of work targeted at their needs. For more information on doing this, see How do I assign remedial tasks to students after an assessment? After the students have learned the recommended activities, set up a post-test. Once the results for that have been finalised, you'll be able to compare the pre and post tests to see how much the students have improved, as well as what areas that they're still struggling with. In addition to setting a pre-built diagnostic test from the NAPLAN Pre and Post Tests, you can also create a quick test from any of the learning material in Education Perfect. This allows you to select the specific content you want to include in the test. For example, you could assign a quick test based on just the Algebra Practice and Number Practice lists in the NAPLAN Practice folder or based on any of the Education Perfect learning material tied to the Australian Curriculum/NSW Syllabus. For more information, see How do I create and assign a Quick Test? If you already know the areas your students need support in, you can skip running the diagnostic tests and immediately choose tasks to assign to your students, including being able to create a differentiated learning plan for each student. You can assign any of the Education Perfect-created NAPLAN content, or any of the Education Perfect learning material tied to the Australian Curriculum/NSW Syllabus. For more information, see How do I assign a task?